My Z31 enjoying some seriously prime street parking, but still sad it’s outside. It’s the same routine every week. While parents are sending kids to school and “fur-parents” are walking their dogs, I am shuffling my car children between parking spots. Sometimes they’re happy, sometimes they act out, but they are definitely alive and have opinions on how they’re treated. This morning I had to move my Scout, which had been on the street for most of a week so I could use one of my precious 2.5 garage spaces to detail my motorcycle. And by “detail” I mean run a rag over and then leave on its center stand to be admired for a few days. But man was that old truck grumpy. First it cranked and cranked, then when it finally fired, it coughed up a nice little billow of smoke to show its indignation at having had to sit in the sun. 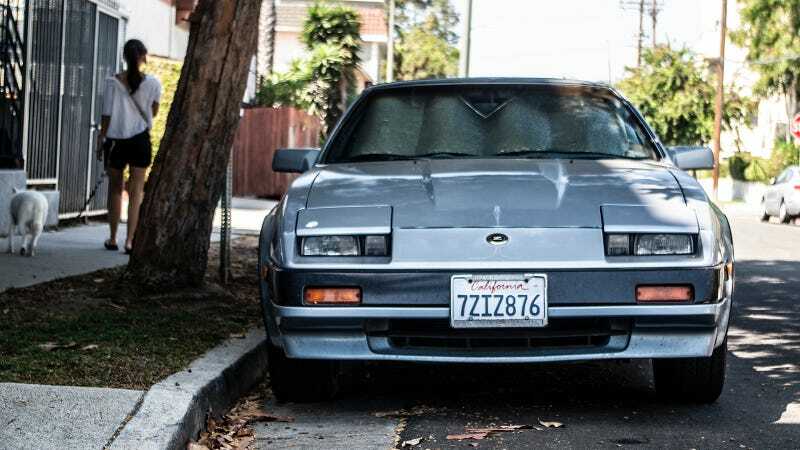 My Nissan 300ZX, on the other hand, which just got shuffled from one side of the street to the other, usually takes forever to crank but started right up and barely even made that weird clunking noise in reverse as I guided it into the most precious of all types of LA street parking: shady and at the end of a curb. Forget a Rodeo Drive valet valet line, a street spot under a tree is the ultimate automotive luxury in Los Angeles. The Z is still high off its appearance at the Petersen Museum Japanese Car Cruise-In last weekend, so I wasn’t surprised that even a little bird poop didn’t deter it from being cheerful. It’s a small price to pay for being out of direct sunlight, anyway. I probably don’t have to tell you that the bike, basking in a bath of Meguier’s waterless car applied lovingly with a gross microfiber towel, is purring like a satiated kitten when I turn it on now. As for my Acura, I can tell you for sure it always zooms like an uncaged animal after a recent wash. Or at least a full tank of premium gasoline. I have had these irrational theories that cars run better when they’re loved for a long time, but had to laugh when I was validated on Twitter this morning and inspired to write this blog. Of course, what’s actually happening in the Scout’s case is probably that some crappy old seals shrivel a little when they’re not heat cycled which caused a little oil to hit my block which burned off in a small cloud. As for the Z, since it was used recently, it was more primed to come back to life. But the psychosomatic effects of a happy-seeming car are strong, and I actually really do feel like my hardware works better when it’s washed and fully fueled. Car care is just like hygiene. Who among us doesn’t feel smarter and more productive after a shower? I think if you’re as obsessed with cars as I am, that same feeling extends to your vehicles and when they’re looking good you’re happy and when you’re happy everything just seems better. So take care of your cars and they’ll take care of you. Even if only in your mind.